eBay Find of The Day: This Guy Knows How To Make an Ad ed. 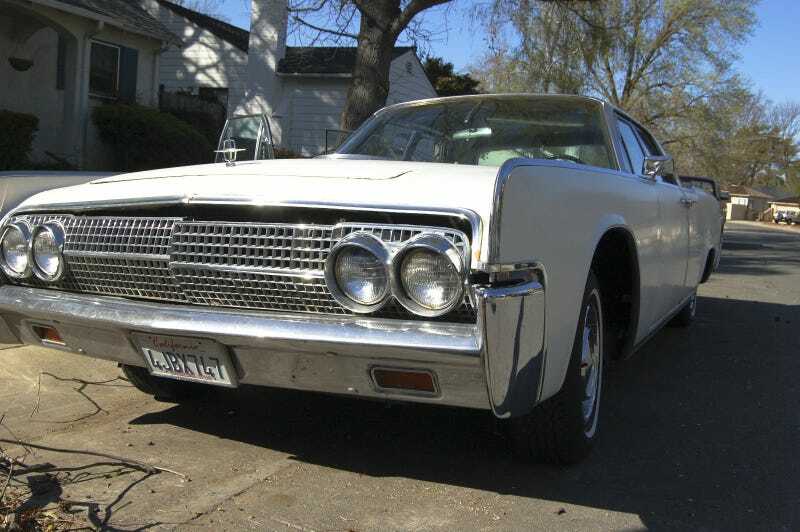 1963 Lincoln Continental, $8,000, Tarzana, California. I would use my own words to describe this car, but the seller has already done a perfect job. Make an offer on this one of a kind (kind of, not really) never before seen (im sure they made a lot of them but they are rather rare) super machine of awesomeness. ok that last part is true but do keep in mind this is not a stock car. this is a hot rod Lincoln. this car is still one of the most sought after tuna boat hot rods in film, tv, and daily life. They have used this very model in films from the Matrix to popular HBO shows. you will impress many people with this car. why am I selling it? honestly I rather wouldn't. I would rather take my time and love on the thing daily until kick the bucket but I also would like to move to another state with the rest of my toys and I do not want to haul this car across country. yes it drives, very well when it is not leaking. please see below for details but again I cannot stress enough this is a simple repair that will make this car a dependable daily if you don't mind the gas. the gas, this is a racing motor with a small rv cam ( I have the spec sheet, don't ask me now I will not get up from my comfy couch to go look at it, you understand), this was not done by me. however the car likes 97+ octane fuel and with the high compression will knock a bit with straight pump gas. it will run all day long but you must remember this motor is rated at over 500hp. Kennedy bought a 61 Lincoln but had a grill from a 63 installed because he liked it better. Brad Pitt once rode in this car (sure it was merely his face on a dvd box but it counts). Al Bundy, Ted Bundy's older brother, lost his virginity in this car and gifted it to his mother in law who started a tv show based on the dysfunctional family exploits of her now estranged son in law. Aliens from Pleiades have personally converted 6 people to a very popular religion while riding in the back seat of this car, two of which reside in NOHO and one is starting a band. They would like to use this car in an upcoming music video so I hope you like hip hop. the current pope is on record saying that his next car will be this car, so I hope you buy it first because I don't want to ship this to Italy. She come with the car?